"Ornamentation is the principal part of architecture, considered as a subject of fine art." 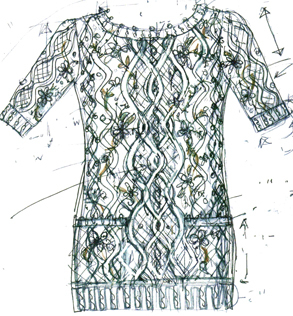 There are times when I am fortunate enough to see the elemental design graphics for our art-knit masterpieces while still on the drawing board. I cannot help but appreciate not only the artistic talents of our designers but also the ability to design architecturally a wearable piece of art. For example, our Handknit Corset Tunic is exceptionally difficult to render as the front exhibits a knit latticework pattern with hand embroidered climbing vines and flowers. The bas-relief dimensional cabling reminds me of the sculptural temple carvings seen in Indian architecture. Just as those impressive stone works exhibit the talent of its designer and the masterwork of the stone mason, each meticulous stitch of our knit sculpture was also mapped and crafted by gifted hands. (Reuters) – A ceremonial plaza built 5,500 years ago has been discovered in Peru, and archaeologists involved in the dig said on Monday carbon dating shows it is one of the oldest structures ever found in the Americas. 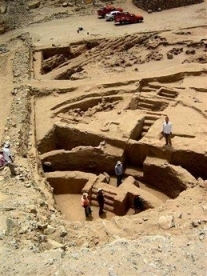 A team of Peruvian and German archaeologists uncovered the circular plaza, which was hidden beneath another piece of architecture at the ruins known as Sechin Bajo, in Casma, 229 miles north of Lima, the capital. Friezes depicting a warrior with a knife and trophies were found near the plaza. The Chancay people inhabited the Chancay and Chillón valleys on the central coast of Peru circa AD 1000 – 1476. 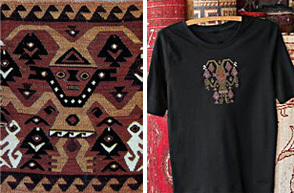 They are best known for their textiles and fortunately thousands of Chancay textiles survive in museums around the world. This is in part due to a good environment for preservation on the Peruvian coast, but is also probably the result of extensive production. The Chancay are often compared with the more widely known and intensively studied Chimu culture of the North Coast. The Chancay and Chimu were often in conflict with each other because they shared a common border. However, because of this, they share many similarities in their textiles. Both kingdoms were conquered and incorporated into the Inca Empire in the mid to late 13th century AD. Our Chancay Warrior T-Shirt is hand embroidered to replicate an original textile depicting a warrior deity preparing for battle. Notice he is surrounded by fish and as a coastal people the Chancay used fish not only as a food source but also as a ritual ingredient and even the fish bones were utilized as part of their weaponry. As you may have already surmised, Annie is an enthusiastic and learned collector of textiles from around the world. Her passion for these windows on culture is contagious and so it is not surprising to find our design team pulling inspiration from textiles from around the globe. Such is the case with our Grand Bazaar Cardigan (pictured above). The name was chosen to reflect the rich spicy hues present within Istanbul’s largest market. However, the motif design itself is from an African mud cloth pattern. Bogolanfini, which translates as "mud cloth", is a long established tradition that originated in central Mali. Hand-dyed mud cloth uses a centuries old process with numerous applications of various plant teas and mud to dye hand woven cotton cloth. Each piece tells a story and no two are alike. The symbols, arrangements and color reveal secrets to the trained eye. The designs also define a person’s social status, character or occupation. Mud cloth is an expression of Malian national identity and a symbol of belonging within the African Culture. The Smithsonian Institution has created a fabulous site where you can create your own viritual Bogolanfini mud cloth. Enjoy! The Whirling Dervishes of Turkey are a quiet yet iconic image of Turkish tradition. However, most do not know that the whirling dance is a spiritual ritual echoing the revolutions made in nature and in human spirituality. To learn more about The Whirling Dervishes visit this great site.